I am resident at the National Trust property, Leith Hill Place, for the spring of 2019 and invite all visitors to the house to contribute to a collaborative sculpture. Inspired by one-time mistress of Leith Hill Place and creator of the Rhododendron Wood, Caroline Wedgwood, this sculptural project is part of the Leith Hill estate’s 2019 programme focusing on 'outdoors & well-being'. Visitors to the house are asked to choose a handful of clay, create a flower and place it on the wood pile plinth. The work explores the idea of creative making being a route to connection with others and to being happier in oneself. Visitors are encouraged to return to see how the sculpture grows and review its progress in this photo gallery. The initial idea was to use the legacy of Caroline Wedgwood’s Rhododendron Wood and her mothering nature to create something that could be “mothered” or cared for by visitors. It is thought that Caroline Wedgwood suffered from mental health issues for a time and it became important that the project reflected this. The earth on which the house sits and allows the rhododendrons to flourish, is heavy clay. 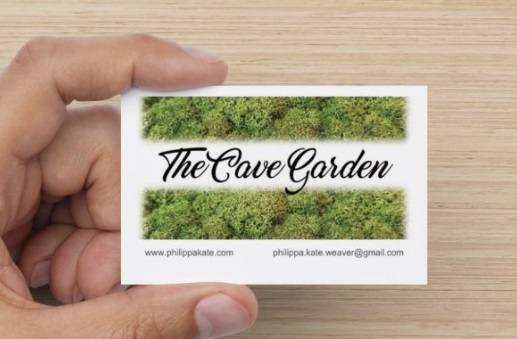 The concept of “The Cave Garden” was born from a fusion of “garden & woodland”, “mental-health”, “caring & mothering” and “clay”. “The Cave Garden” is in the cellar of the house. The challenge was to create a workable project within this unusual space. It is a cold room with no windows, an awkward entrance way with steep steps, walls that could not be drilled into, and no power points or proper lighting: all creating some interesting boundaries to the project. How to use this space became about creating another worldly scene, taking natural products and placing them unnaturally, hoping to highlight for the visitor the natural beauty of the wood and clay in this unusual setting. Sitting with the wood-piles, listening to the recorded bird-calls, forming clay into objects, placing the objects on display, creates a scene in which visitors play or act a part. In doing so, the visitors co-create a sculpture - a sculpture that no one person controls and that has no end point other than that of a random date. Initially the project was only going to use natural products all foraged for locally. For a number of reasons this became impossible and compromises were made. The end result is an uncanny mix of real and unreal. Access into the space was awkward so the steel cages were designed to be built on site and the grass had to be cut to size before being taken into the space. All the logs had to be carried down by hand. A number of health and safety concerns had to be addressed. Posters and reminder cards were designed and installed inviting visitors to participate and to follow progress on-line. Caroline Wedgwood was born Caroline Sarah Darwin in 1799 or 1800, in Shrewsbury, Shropshire, England. Her parents were Dr Robert Waring Darwin and Susanna (Sukey) Wedgwood. She married Josiah Wedgwood III on Aug 2, 1837 and gave birth to Sophy Marianne, Lucy Caroline and Margaret Susan. Her brother Charles Robert Darwin is the famous naturalist. She had four other siblings. She died in 1888 at Leith Hill Place, Surrey, England. Caroline was a prodigious correspondent. Her letters to Charles Darwin dated between 1826 and the year of her marriage (1837) confirm her as a family orientated and caring woman. She writes about children, animals, horse-riding, books (often recommending books and authors) and has a strong sense of humour. She often promotes others over herself and was anti-slavery and was also involved in establishing a new infant school in Shrewsbury 1833. Caroline suffered mental health issues in 1854 at the age of 54 and saw a local specialist doctor – Benjamin Brodie – who wrote a book “Psychological Inquiries” (1854). Caroline took the place of her own mother to her younger brother and sister. Charles says just after her marriage “I am very glad of the marriage for Caroline’s sake, as I think she will be a very happy person, especially if she has children, for I never saw a human being so fond of little crying wretches, as she is. But I am an ungrateful dog to speak this way, for she was a mother to me, during all the early part of my life." Caroline's parents were gardeners and she seems to have inherited a strong interest in botany. She writes in 1826 that “We have all been taking to gardening very vigorously, and shall expect some very elegant compliments from you on its beauty; and I assure you it is very gay, and much admired"
There are both physical and mental benefits from expressing yourself by creating something. Art offers an outlet and a release from stress and anxiety. Making with clay can provide an outlet for grief and help with self-identification and self-expression, bolstering confidence and self-esteem. Making a small object can improve focus and allow an escape from the here and now. During the process, outside influences don’t affect the maker as time is dedicated to creation. Being able to fully focus on something helps the mind relax and expand, which helps focus in other areas of life as well. Our hands are an outlet for creativity, the sense of touch is of high importance. Making allows exploring and experimentation – expressing creativity is essential to expand who we are and how we connect to ourselves, each other and the environment. “The Cave Garden” is not only sponsored by the National Trust but also by Grass Direct and Coleman Electrical. © 2018 copyright Philippa Kate Weaver. All rights reserved.